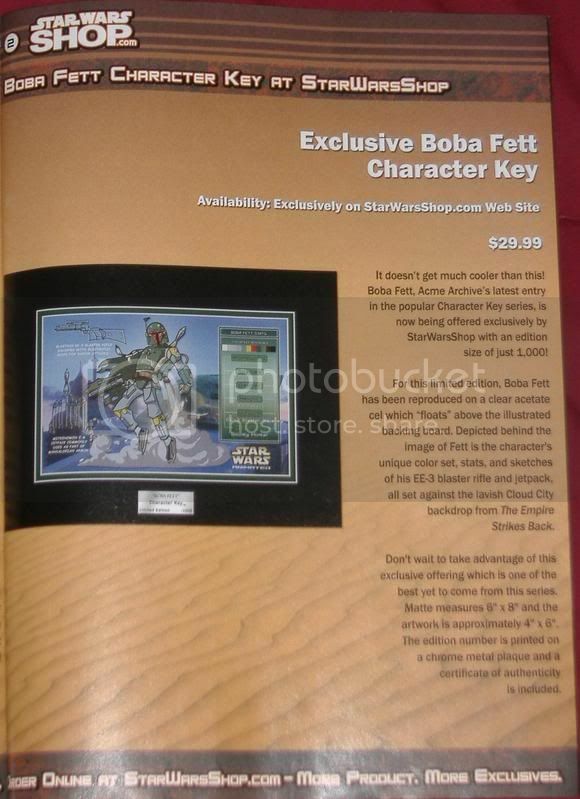 Another item listed in this month's Star Wars Insider is an animated Boba Fett character key, limited to one thousand pieces. They're going for $29.99, which isn't too bad at all. Looks pretty sharp. Again, here's another picture of the page (sorry again, need to get a new scanner). However, I have found them on eBay already, so these will have some crisper images of what it's going to look like. Here's just one of the auctions with a decent picture on it. Further proof that Boba Fett is in Star Wars Animated, yes? That would be so sweet, wouldn't it? As long as they portray him correctly. I agree with Mel. I hope they don't make him a pansy coward type guy. Mel, well, the colors will be accurate.